... for Linde Werdelin, so I guess I'll just pop it here! 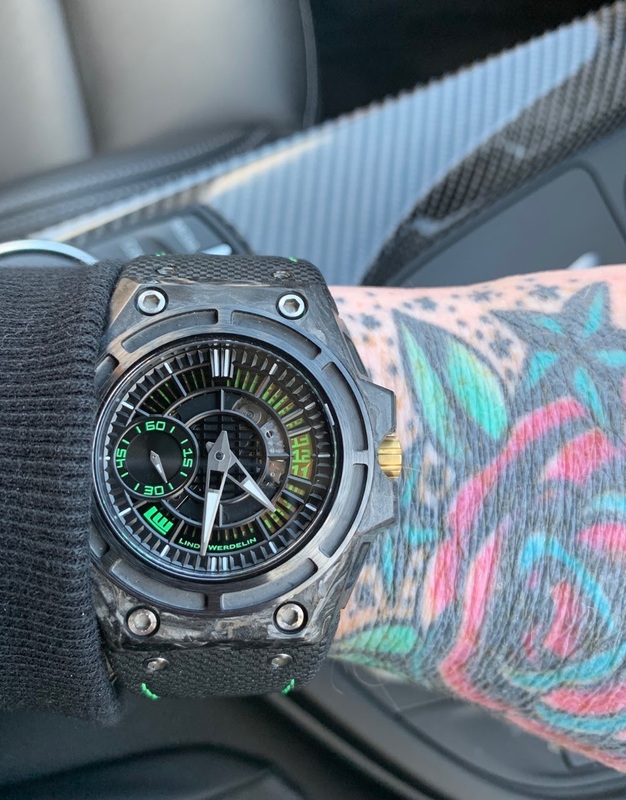 I was lucky today to pick up this Linde Werdelin SpidoLite II Tech Green, whic I guess sits very much in the 'love it or loathe it' camps. I was so taken with the carbon case, i couldn't resist the opportunity. Being forged carbon, it is incredibly light and is shared with a ceramic bezel and Linde Werdelin's own ALW (alloy LW). The case features a display case back, which reveals the decorated movement and LW branded rotor. The modified 7750 (by Concepto) offers a 42 hour power reserve. The design remains fairly unique and designed to 'accept' the two instruments, the rock and the reef, for use, as it sounds, in the open air, or below the sea, which simply click onto the watch head. Lume is poor and legibility isn't great to be fair, but I still love it! I intent to change the gold grown for a black one and order a couple of straps, but pleased to own no. 20 of just 75. Huge Congrats . Thats a beautiful LW . Like the carbon case very much. Always liked LW, the design and feel. Must admit, the first few days of wear can mean it stays or goes with me and so far I am really enjoying the watch, so hopefully a keeper... It is proving accurate and really comfortable and now starting to buy straps!